What does IBM WebSphere Remote Server do? IBM® WebSphere® Remote Server provides a service-oriented architecture (SOA) platform for integrating new and innovative technologies into distributed retail environments. It is designed for remote retail locations where innovative customer-facing technologies are required to respond to new customer demands and opportunities. IBM WebSphere Remote Server is also referred to as IBM WebSphere Retail Store Server Editions. These editions are designed to deliver reliable, security-rich operations and centralized management of technologies across networks with several to thousands of remote locations and devices. Add new technologies as they become available and creatively integrate them to boost efficiency and offer a differentiating customer experience. Provide the goods and services consumers need at the right location, time and price. 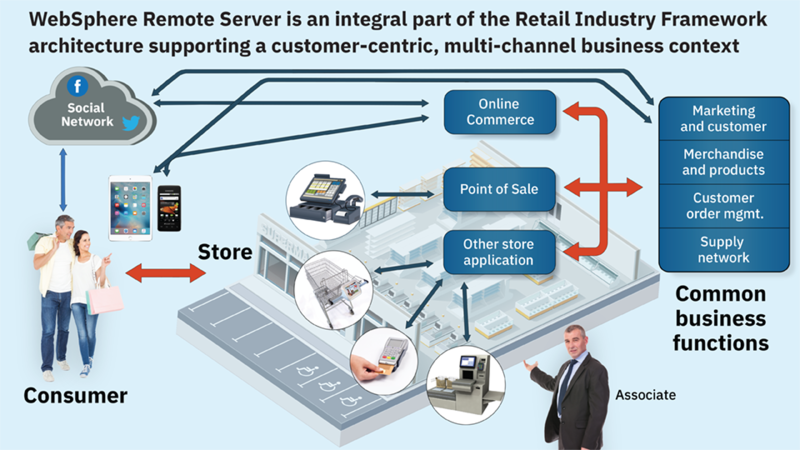 Benefit from mobile, point-of-sale (POS) data transmission, radio frequency identification (RFID), dynamic product information, inventory control applications and more. Choose configurations for the store and the enterprise: basic store infrastructure and management, in-store application integration or an enterprise platform. Provides an entry point to IBM Middleware with usage restrictions. Provides IBM Integration Bus and IBM Monitoring and Provisioning Add-On for IBM Retail Store Server.